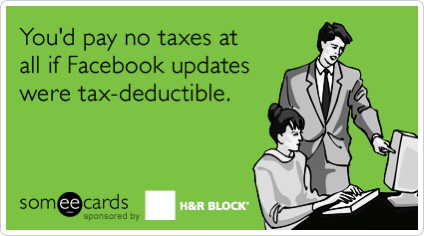 Or more particularly let’s talk about Facebook and their tax payments. The methadone programme that is this blog is working pretty well and I now have an awful lot of non blog commitments these days. So until after the Budget I will just post when I can rather than every Monday. So those of you who haven’t already – you might like to sign up to email notifications on the right of the screen. Coz dear readers I would hate for you all to miss anything I had to say. As a further aside I am also open to topic suggestions andreataxandyoga@gmail.com altho I give no guarantee as to when they may turn up. Now after dealing with Apple, family stuff and Sydney last week; dear readers I was and am a little tired. So as a bit of lite relief after all the nasty multinationals stuff I thought I’d finish off a post on GST I have had in the can for far too long. A reader asked for it last year but it keeps getting crowded out. Soz J. But then this morning on my feed was a news item on Facebook and how they have very little income or tax paid in New Zealand. And how everyone who gets advertising in NZ contracts with Ireland. And they have very few staff here but earn all this money. But it’s not in their accounts. Ok right. GST post down you go and Facebook here we come. Now I have said a number of times there are many and varied ways of not paying tax. Apple uses a wheeze where they give the appearance of being a NZ company but because they are really an Australian company with no physical presence here they don’t pay tax here. Looking at the 2014 accounts of Facebook New Zealand Limited and the news item Facebook’s wheeze seems to be separating out the income earning process so only some of it sticks in the New Zealand tax base. Again once upon a time businesses advertised in newspapers or magazines that were physically based here. They would also have had a sales force that would have been a department of the newspaper or magazine probs also based in the same building as the publication. Now the newspaper or website is in the cloud which just means a server somewhere. But there is still a sales force – or at least a sales support force – based in New Zealand. These guys are employed by Facebook New Zealand Limited a NZ incorporated company that earns fees from for its sales supporting. Now a NZ incorporated company as you know dear readers this is prima facie taxable on all its income as it is tax resident in NZ. Ah you say but ‘what about the directors? Where is the control?’ Well done dear readers yes there are three foreign directors . Sigh. An Australian, an Irishman and a Singaporean. Beginnings of a bad joke. But good news is probs hard to show control in any one country. So probably still resident under a treaty in New Zealand. And even if it isn’t as the sales support income is being earned from a physical presence here – note 7 shows office equipment – so probably fully taxable here. But expressions involving small mercies are coming to mind – it is only sales support income. But should be at armslength rates – usually done as a markup on cost. So there should always be taxable income here even if it is small. And in the old days not only would the sales force be in NZ, the advertising contracts would be made with a NZ company. Not now. The Stuff article shows advertising agreements being made with a sister company in Ireland – Facebook Ireland Limited. This is also referenced in note 13 of the 2014 accounts so it must be true. 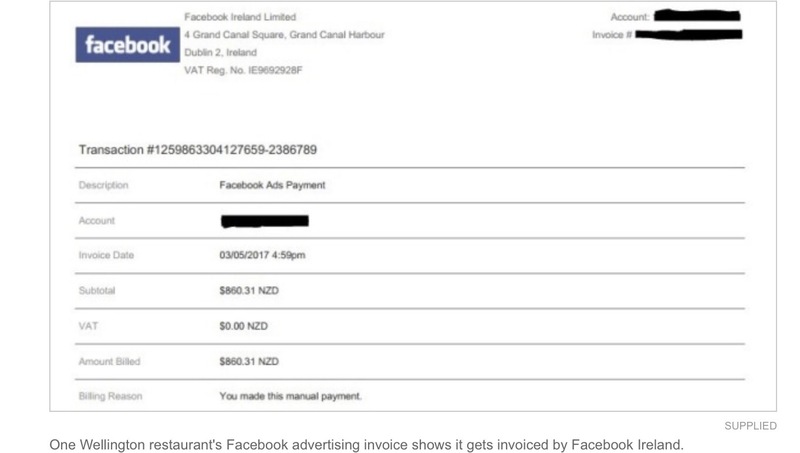 Now it is conceptually possible that Facebook Ireland Ltd is a NZ resident company if it had NZ directors – please stop laughing – but I am going to assume it isn’t. So let’s do the source rule thing. By now dear readers you will be quite expert on the whole trading in versus trading with thing. If there were no people here I would have said that this was trading with again. However the people on the ground – albeit employed by the NZ company – complicate the issue and what with the possibility that the contracts are partially completed in New Zealand. Hey I am going to give it a New Zealand source! But then we go to the Irish treaty. Now the normal fixed place of business stuff can’t apply as it is Facebook NZ not Facebook Ireland that has the fixed place of business. However Article 5(5) provides that if another company – Facebook NZ – habitually enters into contracts for Facebook Ireland then game on – PE. Yeah that is a bit clever and yeah that is what the tax avoidance provisons are for. And we can’t assume that the Department isn’t trying to use them. The Irish treaty was concluded in 1988 long before BEPS; the international tax rules were only just coming in; and the Commissioner engaged in trench warfare that became the basis of the Winebox. Number 4 might be a bit of a struggle. This struggle is alluded to in the discussion document’s technical appendix. Apple is example 1 and Facebook example 3. Example 3 discusses the application of the DPT NZ style and says it really is only any good if new treaties get new PE articles. And then says that maybe some countries won’t want them. Let’s all take an educated guess what Ireland will think. But don’t panic. The OECD is doing some work on this which should come out in 2020. Awesome but wasn’t this exacly what Action point 1 was all about? Changing the subject slightly last week Gareth Morgan put out his international tax policy. Most proposals were either the existing law – payments must be armslength or won’t get deduction – or government proposals – burden of proof should be on taxpayer. But his key point of difference is he wants all treaties ‘wound back’. I am not there yet but good on him for putting it on the table. And given the public anger on all of this and OECD not reporting until 2020 when it was one of the original primary issues with the BEPS project – I would watch this space! All this discussion on Facebook is only possible because until 2014 they had to file accounts with Companies Office. This changed in 2015 to large companies only. Because compliance costs. They still have to file accounts with IRD but rest of us don’t get to see them and their related party transactions anymore.